Chandra is a 24 year-old man who comes from a place called Koholpur in the district of Banke in mid-western Nepal. In April he was working as a labourer in Sindhupalchok when he injured himself at work and sustained lacerations and trauma to his left calf. He was taken to a nearby medical shop and helped to buy bandages and pain killers and was sent back to his work place accommodation. It took a month for his wound to heal and he found once it had healed he had tremendous difficulty walking. His employer gave him NPR 3000 which is about $30 and sent him to Kathmandu for treatment. 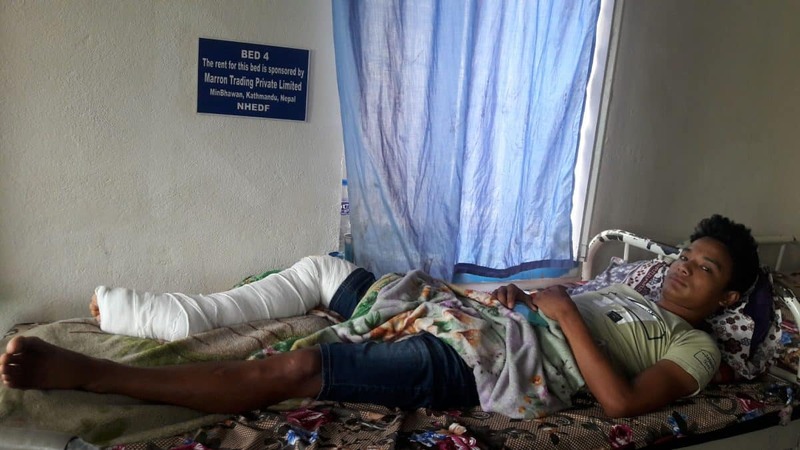 He consulted a doctor in a Government hospital who advised him that he had lacerated his ligaments and required urgent surgery. He had to wait for two weeks and then was finally operated on at a cost of NPR 40000 – approximately AUD $400. He now has no savings left. The hospital where he was operated on was overcrowded and he was discharged on the second day after surgery. He had no one to stay with in Kathmandu and no money left for further treatment so he was referred to NHEDF. He is currently on bed-rest and requires medications, dressings and physiotherapy. 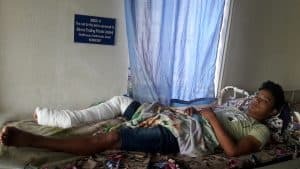 Previous Previous post: Read another patient story about Budhi Bahadur who was injured during the course of his work in Malaysia.